<b>CANDID CAMERA:</b> Police Chief Cam Sanchez (left), assistant chief Frank Mannix (right), and spokesperson Sgt. Riley Harwood (center) brief the council on body cameras, crime rates, and staffing difficulties. 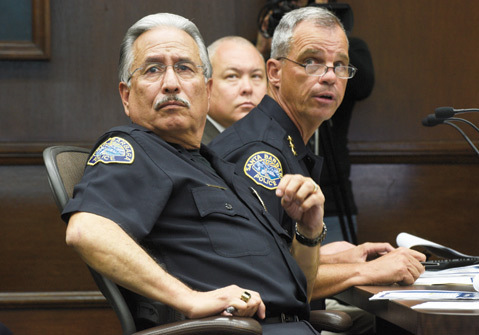 Less than two years after equipping all Santa Barbara police cars with dash cams, Police Chief Cam Sanchez is now exploring the feasibility of equipping his officers with body cams. Sanchez told the City Council Tuesday that his department was about to secure five such cameras for a test run. Body cams, he said, cost from $600-$900 each, and that doesn’t include the $70,000 he estimates the digital storage and access software would cost. The model currently under review is not compatible with the software used to store the digital load carried by the dash cams. To the extent Sanchez found himself on the hot seat during his monthly council presentation, it was from downtown business interests frustrated that it’s taken the department so long to hire and field a full complement of Community Service Officers (CSOs), a new hybrid quasi–peace officer with the authority to issue citations but not to wear a gun or arrest people. The Downtown Organization (DO) lobbied hard for an additional police presence along State Street to deter street people from harassing and annoying residents, tourists, and shoppers. DO chief Maggie Campbell expressed keen frustration that the CSOs hadn’t been hired yet when they were initially scheduled to provide a “supplemental ambassadorial” presence in April. Likewise, Campbell expressed suspicion that the department would poach the CSOs, treating the program as a recruiting vehicle for new cops. Four of the new CSOs have been hired, the council was told, and the program should begin sometime late in May. The department has been short-staffed recently, with 10 officers out on injury, 10 still in training, three transferring into other departments, and a few about to retire. As a result, the department now has 117 sworn officers at its beck and call when it’s authorized for 144. Currently, the department has a field strength of 47 officers; but for the shortage, there would be 57. Hiring new cops has been difficult, the council was told, because the economic recovery made the job less financially attractive and because of anti-cop publicity stemming from the Ferguson fallout. Even so, assistant chief Frank Mannix explained, violent crime is up only a smidgen above the city’s five-year average. Property crime, however, has increased significantly. Part of that stems from what Mannix described as “a bloom” of residential burglaries that took place in February and March. In addition, he said the department has seen a spike in lower-level larceny charges ​— ​for shoplifting with premeditated intent ​— ​that before the passage of Proposition 47 would have been filed as felonies. With the jail full, Mannix said such offenders are released, only ​— ​in some cases ​— ​to offend again. Because of this staffing shortage, Chief Sanchez explained he would not be able to allocate an officer to Santa Barbara High School as he had the past two years. This has generated some grumbling from the school district. The department’s retinue of five beat commanders, Sanchez said, had atrophied to only two. He vowed to get it back to full staffing. Given present realities, he said, he couldn’t do that and also provide Santa Barbara High School an officer. Instead, he said, he’d assign an officer to serve both as Eastside beat coordinator and school liaison officer.